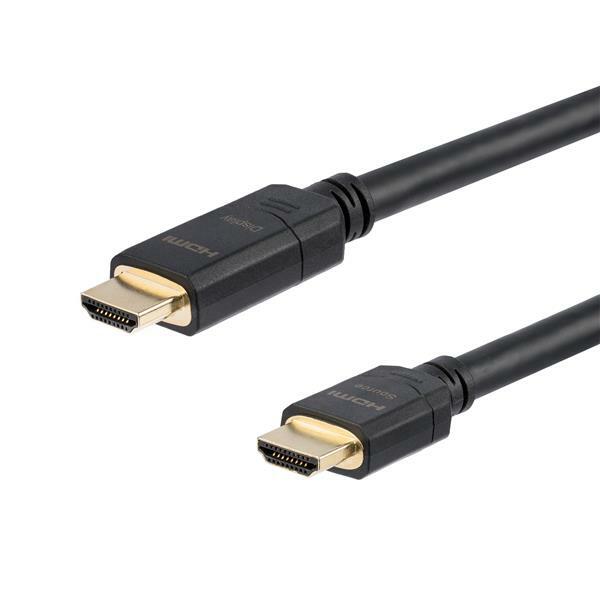 This active HDMI cable offers a connection distance of up to 100 feet (30 meters) between your HDMI enabled devices. It meets CL2 rating safety requirements, so it’s ideal for in-wall cable runs in your home and office installations. The cable features built-in amplifier circuitry which actively boosts your HDMI signal, with no external power required. It's the perfect solution for longer transmissions without any signal loss. The HDMI cable is CL2 rated for in-wall installations, which makes them perfect for A/V installations in residential or office settings. You can set up your home theatre, gaming or audio-video equipment with the cables hidden away safely inside the walls and place your devices as needed throughout your work or living space. This high-quality HDMI cable fully supports 1080p+ resolutions at up to 120Hz refresh rate, with life-like color. To accommodate the demands of future high-definition devices, such as increased resolutions and higher frame rates, this Ultra HD cable supports resolutions up to 4k x 2k. The HDMM30MA is backed by StarTech.com's 2-year Warranty for guaranteed reliability. Note: This cable features unidirectional architecture which requires that the cable is installed in the correct direction. Please refer to the Source and Display labels on the HDMI connectors in order to ensure that the device and the HDMI source are connected properly. Please put a REALLY BIG sticker with the one way signal!